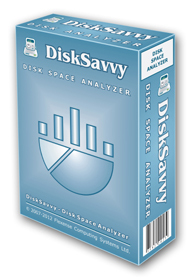 DiskSavvy is a disk space usage analyzer capable of analyzing disks, network shares, NAS devices and enterprise storage systems. Users are provided with multiple disk usage analysis and file classification capabilities allowing one to gain an in-depth visibility into how the disk space is used, save reports and perform file management operations. 14-Mar-2019 - DiskSavvy v11.7 adds the ability to display timeline charts showing the amount of disk space and the number of files per creation, last modification and last access year. In addition, the new product version adds the ability to export all types of pie charts and timeline charts to the BMP, JPEG and PNG image formats. Finally, the new version improves the main DiskSavvy GUI application and fixes a number of bugs. 14-Feb-2019 - DiskSavvy v11.6 adds the ability to categorize and filter disk space analysis results by the creation, last modification and last access hour. In addition, the new product version improves all types of disk space analysis reports, improves disk space analysis pie charts, improves the main DiskSavvy GUI application and fixes a number of bugs. 22-Jan-2019 - DiskSavvy v11.5 adds the ability to display the top 100 recently created or modified files sorted by the file size and the top 100 old, unused files sorted by the file size. In addition, the new product version adds the ability to filter disk space analysis results by files contents using regular expressions, improves the disk space analysis history dialog, improves the main DiskSavvy GUI application and fixes a number of bugs.